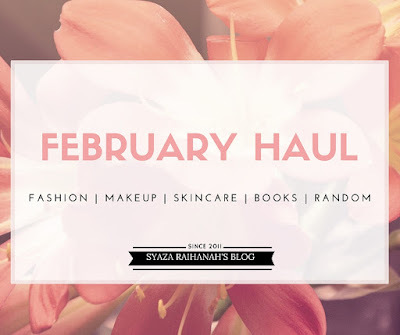 My second haul posts on my blog. Every month I will update an entry about everything that I bought for that month. Always wanted to share with you what I bought so if its good product/things, maybe you can give a try? Why not, right? So, without any further, let's jump to the haul!!! I just run out of cleanser on the last January, so I want to try a new product or brand since the last brand that I used doesn't give any improvement at all. So, I'm still in the process to find the perfect cleanser for myself by trying a new product after finished the old cleanser. I found about Mentholatum cleanser after a few blogger shared about the cleanser on their blog. It is so tempted to NOT to buy since the product is made from natural ingredients. So, I grabbed it for myself. So far so good. Doesn't give any bad reaction to my face. Other than that, I love the scent of this cleanser. There is a few selection of choice regarding your skin types. As you know, I'm the one who have oily skin, so pick up the green one. The other two is for dry skin and normal skin if I'm not mistaken. I bought it at Guardian for RM 12.60. This is my second bottle, okay! I love it so much! It does remove dirt, refresh my face and also refining my pores. Plus, the price is quite cheap tho which is under RM5. Believe it or not? Really really recommended! To save the toner, I did put the toner in a spray bottle (travel size). So whenever I want to use it, I just need spray onto the cotton pad three times and it is enough for my whole face. Other than putting the toner directly to the cotton pad cause it tends to drop and something. Maybe you guys can try this tips to in order to save your toner or any liquid form by using the spray bottle! I have been wanted to try a brown eyeliner for quite long time cause it gives a natural kind of look plus it doesn't look too harsh in your eyes compared to if you use black eyeliner. Since this eyeliner is waterproof and long lasting, its a benefit for me because I don't have to touch up my eyeliner every single time since my eyelids tend to be oily and it will get smudges every single hour. It not cool, okay? You guys should try it! Wanna starts my new healthy life. So I decided to drink green tea. Tried to drink a cup of green tea every day but yeah, forgot and lazy is my major problems. At the end, I always end up missed to drink it every day. Did you know that green tea has benefits like weight loss, anti-aging and more? You can check it my previous entry where I share the benefits of green tea. How I drink my green tea? A cup of hot water and a tea bag of green tea. Without sugar, okay. How it taste? A bit bitter but it's okay! I just used to it and it still tastes nice. Yay! Bought this because I suffered sunburnt after swimming at the waterpark without any skin protection like UV and etc. Because of that, my skin especially faces and my wrist got irritated. It started to get red and tingling for about 4 days. After apply aloe vera on the problem areas, it feels a little bit better. Next few days, my skin started to peel off. Arghh, never go outdoor without any protection, okay? By the way, this aloe vera is from Elianto. It cost you RM19.90. Even now I used this aloe vera as my moisturiser every single time (I just ran out of moisturiser at that time) but it still looks like I never use it! I still have a lot of product. It does moisturise your face and dries fastly. Can I say that this product is the BEST blackhead remover in the world? Like seriously, I used it so many times and it still amazing! Bought it after heard a few feedback about this mask. It cost you only RM 8 and I bought it at the beauty shop near to LRT Masjid Jamek. If you want to know more about these Vietnam Mask, you can go check out my review on my previous entry. I think that's all for my February Haul. I know it's kind of late, but better late than never, right? Hehe. So, if you want to know more about the products listed above, just leave a comment (maybe I can do a review for you guys) and I will reply it when I have a free time.